Grandma & Grandpa eager for visit! My granddaughter Melanie will be coming to visit later this week. We're delighted she's coming and eager to hear about her life in New Orleans. Ward has framed the last four of my prints from an early New Orleans series to give to her. She had 3 or 4 small originals destroyed in her New Orleans home when Katrina hit. Mel graduated from LSU over a year ago and is now a lovely young woman ready to take on the world. When she was a toddler, I painted a watercolor portrait of her in her "jammies" holding two little dolls - entered it in an exhibit -got a minor ribbon for it. Later I gave it to Terry, my son ( her father) and they've shared the painting ever since. Luckily, when Katrina hit, this painting was hanging in Terry's condo on higher ground and survived the storm. So Melanie has that painting. When I come across a photo of it, I'll share it with you. Studio update: We are hard at work getting our new print of Old Culver Depot ready for you. More details on this will be posted soon. 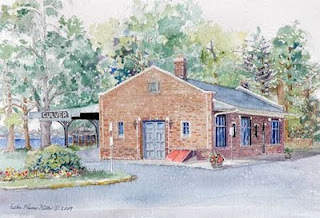 The original of "Old Culver Depot" is hanging in our gallery. Next to the depot painting is "Uncle John's Barn" another new original. My frustrating bout with shingles is gradually going away, and I'm working hard on painting a stone seawall in another watercolor house portrait. Will photograph and post it when done.